Thanks to the folks at the Grand Teton Brewing Co., this bottle arrived in good shape. It has been kept at cellar temperature. There is no “Best by” date on the bottle. Surprisingly enough, there is no mention of this brew on their web site. Appearance: This copper colored, effervescent brew had minute “floaters”… The head was light brown foam of medium to small bubbles, tatting significant Belgian lace. Aroma: The first impression is of floral sensations of no identifiable hop nature. The second impression picked up an undertone of sweet caramel or brown sugar. The third impression was similar to the second, with little change. Mouth feel: The mouth feel is very full, bordering on the obese. There is a very thick impression that I cannot attribute to any specific cause. Flavor: Between lip and sip there was a slight increase in the sweet sensations in the aromas. The first flavor is caramel sweet and it takes a moment for the hops to make their way into the event. The second flavor impression is more tuned to the hops and these hops are as aggressive as can be imagined. I was almost afraid of the third taste impression but soldiered on… by now my mind had wrapped itself in enough sensations to find a balance, but it is tenuous. There is a flavor similarity to dry sherry. Finish: The lingering tang of hops and the equally long lasting caramel note last longer than some might consider comfortable. Comments: Not too many years ago I received a sample of one of the first canned microbrews that had similar mini-floaters and an almost viscous character. Therefore I am going to hold any other comments in reserve until I can contact the brewery and see if I might obtain another sample. Stay tuned… as they used to say in the days of radio. 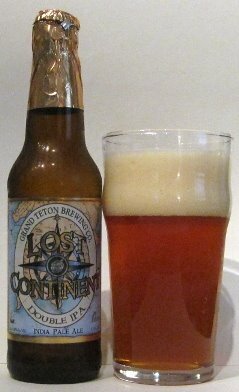 Attached is today’s blog tasting notes for Lost Continent… has anyone else noticed these characteristics? Did I perhaps get a “phunky” bottle? Are you in reference to the “floaters”? These are bottle conditioned and have yeast in the bottle. So that’s what I saw! The possibility did cross my mind when I wrote those tasting notes. I checked the bottle and there was no mention of “bottle conditioned” and so I assumed the worst. Pouring an unmarked bottle-conditioned beer can give the pourer fits… messes with the mind… I’m glad it was all a dream.